Nick Calamos is a native of the Fredericksburg, VA Area. He is the product of hard-working immigrants. His grandfather, George Antonio Calamos (Kalamoutsos), migrated to the United States from the village of Vourvoura, Greece in 1902. He was 17 years old with hardly any money in his pocket and spoke no English when he arrived in New York. He moved to Washington, D.C., where his brother lived, and then, at the age of 23, established a confectionary business named Olympia Candy Kitchen in Fredericksburg. It was on the first floor of the Bradford Building located on the corner of Princess Anne and William streets. That site is now the open space on the corner next to the old City Hall (Museum). 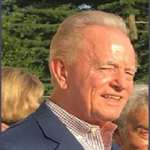 Nick graduated from James Monroe High School in 1961, studied at Mary Washington College through the UVA School of General Studies, Charles County Community College, Germania Community College and numerous real estate courses. Over the years Nick has worked for Va. Electric and Power co, Va. Dept. of Highways and Naval Surface Weapons Center, Dahlgren, VA as a Computer Programer/tech. Nick entered real estate in September of 1968 with Waring Realty, then moved to Griffin, Wishner & Cooke the next year. In 1973 Nick started Calamos Realty, then owned the first RE/MAX of Fredericksburg. He later dropped the Franchise name and operated as Calamos & Associates. He was then hired by Hazel Land Company to lease and sell the Lee’s Hill Shopping Center, later moving to Century 21 AdVenture. In 2001 he transferred to Coldwell Banker Carriage House Realty, Inc. and remained with them until they merged with Coldwell Banker Elite in January of 2017. Nick is now an Associate Broker with Coldwell Banker Commercial Elite and has over 49 years of experience in the local market. He has many millions in residential, land sales, commercial sales and leases and was the first real estate broker in the area to receive the coveted Certified Commercial Investment Member (CCIM) designation in November of 1981. He is a past President of the Fredericksburg Area Association of Realtors as well as a past President of the Virginia CCIM Chapter (Now the Mid Atlantic CCIM Chapter). Nick is a Graduate of Realtors Institute (GRI) and is designated as a Certified Residential Specialist (CRS). He received the status of Realtor Emeritus 2010.